In many Wayback Wednesday features, as well as the 20th Anniversary of NBA Live retrospectives, I’ve discussed how innovative the NBA Live series was during its heyday. There was a stretch where not only was the gameplay getting better every year, but something new was brought to the table in terms of modes, features, and content. With the series struggling to rebuild its core experience over the past decade, that approach has understandably taken a backseat to establishing a solid foundation. It’s getting to the point where we need to see that innovation again, but recent NBA Live games have had their nifty ideas, BIG Moments being one of them. For the uninitiated, BIG Moments was essentially a scenario mode in which gamers were challenged to replicate a feat from a real game. At launch, these included a few noteworthy scenarios from the previous season, but throughout the year, new BIG Moments challenges were added as exciting games and stellar performances took place. These challenges were pushed through very quickly, with the idea being that you could replay a special game or performance – a BIG Moment in the NBA – not long after watching it on TV. Like LIVE Season, NBA Rewind, and Dynamic Season, it was intended to keep gamers hooked from Opening Night to the NBA Finals. As with those modes, BIG Moments was powered by Synergy, ensuring that the specific scenarios were accurate down to the players who were on the court and the amount of time remaining. Scenarios ranged from a few seconds in length where the goal was to replicate final possessions involving buzzer beaters, to having anywhere from a couple of minutes to a full half in which we had to match a statistical feat by a team or player. The tougher challenges often had multiple statistical requirements, or involved an unlikely comeback. The game kept you updated on your progress towards the goal(s), and your performance earned XP for the mode’s community leaderboard. On top of the different challenges, BIG Moments kept you on your toes by changing up the gameplay conditions. In some challenges – particularly buzzer beaters – you were locked to a single player, as in Rising Star. Other challenges saw you controlling all five players as in traditional gameplay. Whether or not you were played locked usually depended on the nature of the BIG Moment, though sometimes it was part of the difficulty. I remember thinking that quite a few scenarios would’ve been easier (and in some cases, better designed) if they weren’t player locked, or vice versa. Apart from buzzer beaters, I came to prefer BIG Moments that didn’t utilise player lock. 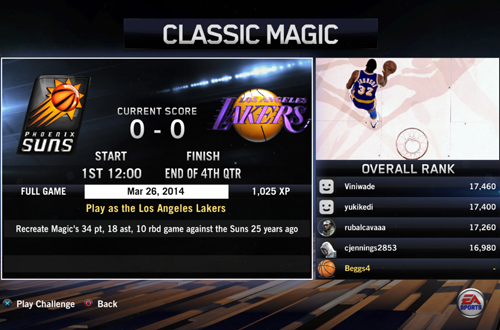 It was a great concept and probably what I played the most of in NBA Live 14, but there were definitely drawbacks. The most obvious one was the quality of the game itself. NBA Live 14 was a rough release, and while the short gameplay scenarios of BIG Moments did sometimes minimise the roughness that was noticeable in other modes of play, those flaws weren’t masked entirely. The stiff controls didn’t make it easy to achieve statistical goals in harder challenges, and there was some guesswork with the pre-meter shooting mechanics. Bad teammate AI could also get in your way, though lapses by your CPU opponents sometimes helped out as well. Another problem was that the longer BIG Moments challenges automatically enabled the accelerated clock option, and it couldn’t be turned off. As such, you actually had less time than indicated. Slow pass and shot animations also added an extra layer of difficulty to buzzer beaters. 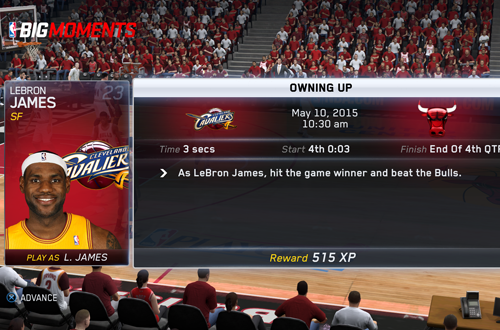 I also remember BIG Moments games in NBA Live 14 being rather buggy. Because the challenges remained available throughout the season, the games were re-created with proper lineups using the saved Synergy data. Aside from a couple of issues with new challenges as they came through, I recall the game crashing quite often in the middle of building a BIG Moments scenario. When they were working however, I did enjoy them; particularly the buzzer beater and other crunch time scenarios. My least favourite were the rebounding and triple double challenges, as the accelerated clock often proved to be a nuisance. EA were clearly into the concept too, as they even pushed through a retro challenge for Magic Johnson, who was in the game as a collectable Legend in Ultimate Team. Gamers were challenged to replicate one of Magic’s most impressive triple-doubles, though aside from Magic himself, none of the other players were historically accurate. Still, it was a creative idea, and an example of what could potentially be done with the mode. 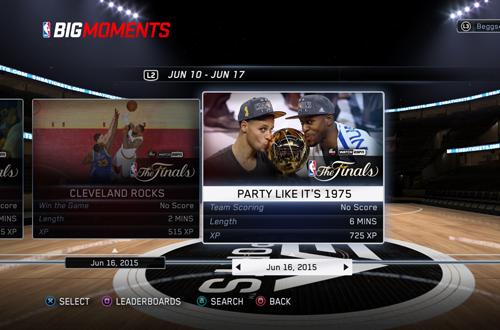 BIG Moments received a few upgrades in NBA Live 15, including the Shot Chart challenges. In these scenarios, not only did you have to make a clutch shot, you also had to knock it down from the same spot on the floor as the player did in real life. This was obviously a little more challenging than the buzzer beating challenges in NBA Live 14, where you could cheat a little and take an easier shot than the one the real player had. An indicator on the court pointed you to the right spot, but getting the ball at the right time wasn’t always easy, never mind making the shot. 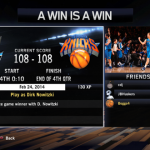 Many of the same issues that plagued BIG Moments in NBA Live 14 were still present, too. Teammates wouldn’t always pass you the ball on cue, and sometimes the player who was meant to take the shot was the inbounder, which didn’t help when there was only a second or two on the clock. When that happened, there was nothing you could do except keep restarting the challenge until the problem resolved itself and they weren’t inbounding the ball. Some challenges were adjusted in order to make them easier to replicate in gameplay, but a combination of a short amount of time, slow animations, sloppy passing, and clunky shooting mechanics contributed to a frustrating amount of artificial difficulty, particularly when it came to the Shot Chart challenges. Despite those issues, it remained one of the best ideas since the series’ reboot, and new content came through regularly in NBA Live 14 and NBA Live 15. Things hit a snag in NBA Live 16 however, as there were several dry spots during the 2016 season where no new content came through for BIG Moments (or Ultimate Team). Around March, the content dried up altogether. BIG Moments were subsequently dropped in NBA Live 18, though the name was reused for special edition cards in Ultimate Team that were based on notable performances. 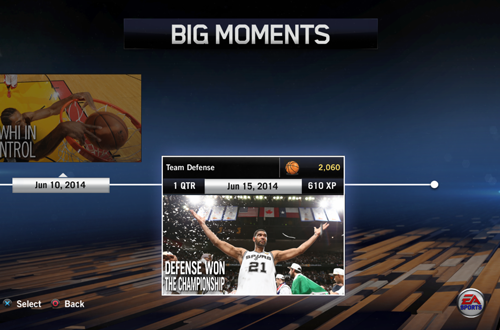 As of NBA Live 19, the original BIG Moments mode remains absent, more or less replaced by LIVE Events in The One. I’ve spoken before about the need to expand NBA Live’s depth beyond The One, and it remains something I’d like to see happen in future releases. While I would suggest that Franchise and Ultimate Team are higher priorities, when it comes to fleshing out the game with extra modes and content, BIG Moments is an idea that definitely would make a welcome return. It underscores the connection to the real NBA, gets gamers hyped up to both watch games and replicate what they see, and adds fresh content all season long, providing an incentive to keep playing NBA Live. Hopefully, the team won’t permanently shelve one of their most innovative ideas on this generation. There definitely were problems with them. If they do come back, hopefully all of that stuff can be resolved so that it’s an even better experience the second time around.